Approx. Weight: 5 lbs. 12 oz. 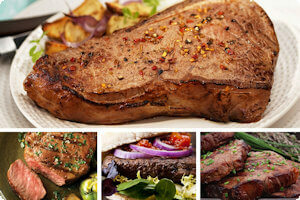 A sampler of all Angus steaks and burgers, sized 4-8 ounces and ready for you to cook up a gourmet dinner. Each dinner guest can enjoy his/her own cut of meat, or you can serve a smorgasbord of small pieces and allow everybody to enjoy the various cuts.